Check out the long-awaited WiiWare title in action. You might remember that Gravitronix was one of the first WiiWare games announced all the way back in October of 2007. We even conducted an interview with Medaverse a few months later regarding the game. Well we've got good news. (Of course any news after almost two years is good) Medaverse has informed us that they are currently pinning down a date for the game's release on the WiiWare service and are finally releasing the gameplay trailer of the game in action. Gravitronix is an action/battle game in which players play as a “Gravity Platform” on the circumference of a circular arena. The object of the game is to defend your territory on the arena while assaulting enemy territories using only your wits, the projectiles that spawn in the arena and the two powerful beams of your Gravity Platform. Each territory is lined with a wall of shield pieces when the game begins. Each shield piece will take three hits before being destroyed. If a projectile exits the arena through a territory, the territory and the players in it are defeated. The last territory standing is the winner. Players can play with either the Wii Remote™ or Nunchuk™ controller. Twist your controller to move your Gravity Platform within your territory. Press the A or C button to push projectiles away and the B or Z button to capture projectiles and take aim at your opponents. Each of the four projectiles has different properties, such as arcing 90 degrees when fired from capture or creating a huge explosion when charged with energy. 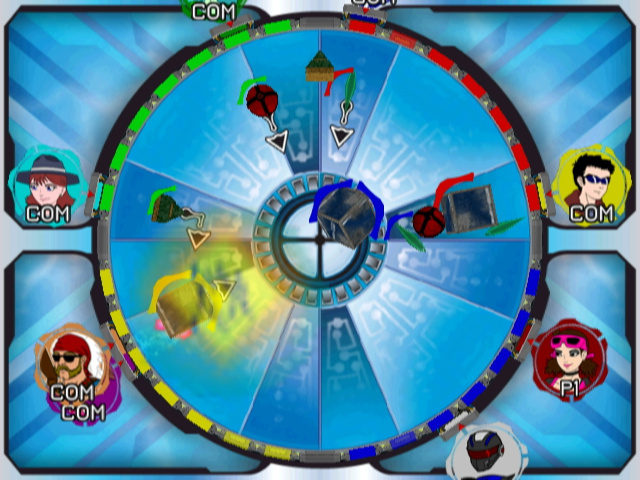 Gravitronix is easy to learn but a challenge to master, and is designed to appeal to gamers of all levels. From players picking up a controller for the first time to veteran gamers who live for intense, heated battles with their friends, Gravitronix offers something for everyone. You can check out the official gameplay trailer below for a taste of what you can expect from the game and we'll let you know the exact release date as soon as we get it. And of course we'll also have a full review of the game as soon as it hits the WiiWare service. Well, this sure looks like crap. Was expecting a bit more actually. ... I dont get it? This looks like it's trying to be some kind of variant on Warlords, but with up to eight players instead of four. Definitely looks like it could use some polish in the graphics department. I'm glad to hear I'm not the only one that had Warlords come to mind. The gameplay looks confusing and the graphics, well, I wouldn't say that they're bad but it not exactly great. After 2 years of development, this is disappointing. They could have at least made the people look "real" instead of like pog chips (maybe made them actually running around, or in vehicles or something). Makes me think of Spogs in that way. I betcha it's fun, actually. Too bad the visuals make my eyes bleed. Color scheme: garish, Clarity: minimal, Personality: zero, Ability to relate: none, Amateur: Bingo. Quick, hire someone to revamp the visuals! Make it actually look fun! Is there a funny animation when someone gets damaged/fails? Anything to amp up the competition, visually? Can it be tied to something physical so we can relate a bit? It just isn't gonna happen, is it? I'll stop now. @Strofan7 I agree. I hadn't heard about it, myself. It may not be the best game but, at 500 points, it's something I can play with my wife and kid and have some fun. I really hope it took them 2 years to upload this video. Which means it will have better graphics than this. The graphics are a bit of a letdown but it looks quite fun for multiplayer and at 500 pts, I'll prolly be giving this a go. Yep, Warlords was the first thing I thought of. I really hope it turns out good. Been waiting for this for such a long time. Its been soooooooo long since we've heard anything about this. This baby was first announced soooooo long ago. wow, that was different from what I expected. Personally, it looks like crap to me. Sad, I thought this game had potential too. Really disappointing with how long it took.